Those of the inhabitants of the Inangahua who desire to see themselves as others see them, have now a full opportunity of doing so by the presence in town of two well known photographers. Mr W. H. Perkins has opened his studio in the premises adjoining Dowsing and Lines' while Mr H. Williams' has also erected a studio adjoining Mr George Wise's office, the latter under the direction of Mr Ring; both artists appear to be well patronised by the public, and some exceptionally fine portraits and local views are on display. At the opportunity of thus securing a really high class picture will only be open to the public for a week or ten days, those who wish to take advantage of it should do so without delay. Mr Williams' photographic studio will be opened on Thursday or Friday. Since his last visit to this town Mr Williams has gained a first-prize medal at the Melbourne International Exhibition, as well as certificates from the Dunedin, and Invercargill Industrial Exhibitions, for his own work in photography while he now introduces to the public Mr George Gregory, one of the most eminent photographers from the Old Country, who accompanies him as operator, and whose work in portraiture, we believe, is unsurpassed in the Colonies. 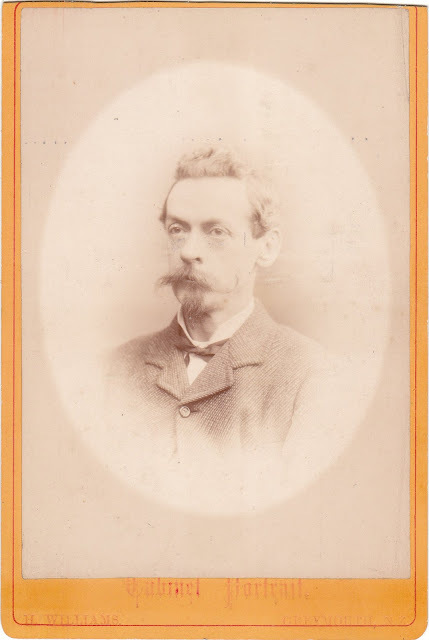 Mr H. Williams announces that his photographic studio is now open in the premises adjoining Mr Schulhofs, Broadway. Mr H. Williams, photographer, will leave for Greymouth before the close of the present week, so that those contemplating a visit to his studio should do so at once. MR. AND MRS. HANWELL WILLIAMS. Two of Greymouth most worthy and respected citizens in the persons of Mr and Mrs Hanwell Williams on the 23rd of March, celebrated their golden wedding. The worthy couple have been blessed with a happy married life and we are pleased to state are still hale and hearty. 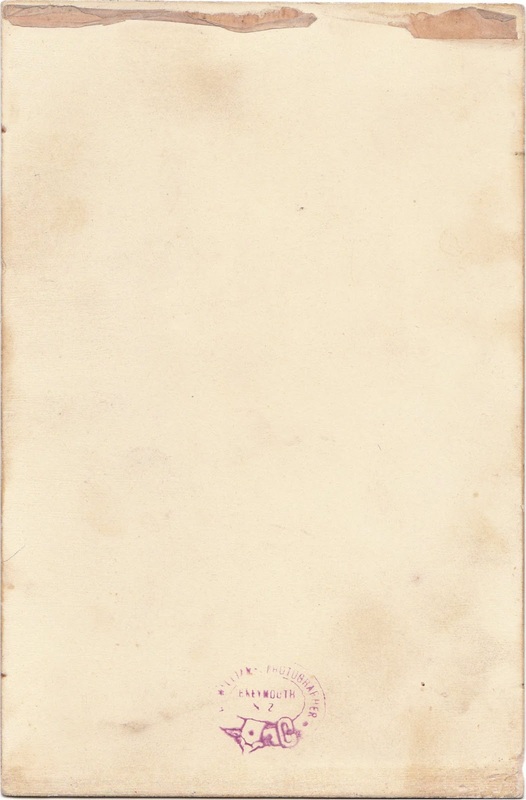 Mr and Mrs Williams were married in Ballarat, Victoria, on March 23rd, 1861. 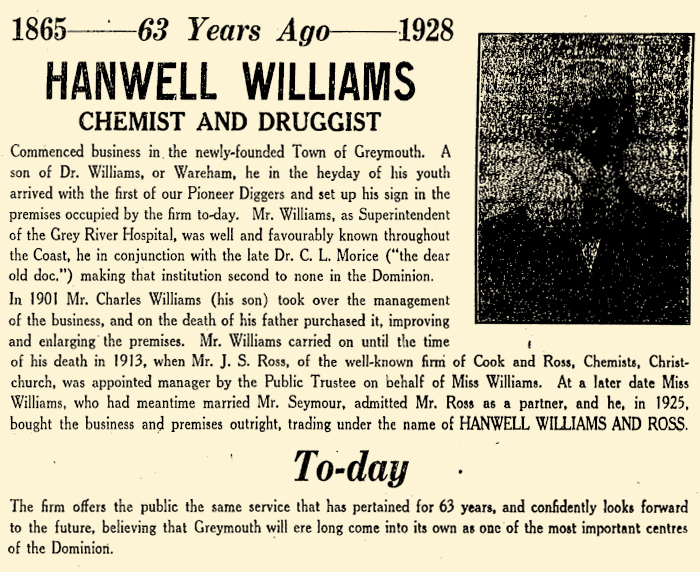 Mr Williams was the son of the late Dr. Williams, of Wareham, Dorsetshire, and was born in that town in 1835. 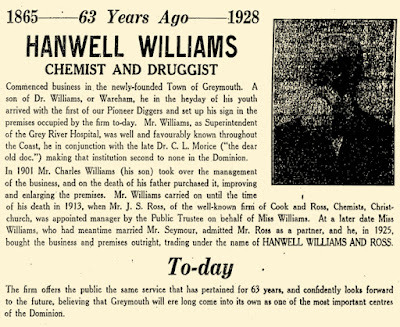 Shortly after leaving school he was engaged as a dispensing assistant first at Dorchester and afterwards at Netther Stowey, and finally he entered the noted West of England drug house of Holman and Hams, where he perfected himself as a pharmacist. Mr Williams came out to Melbourne in 1857 on board Money Wigram's famous ship in those days "The Kent." 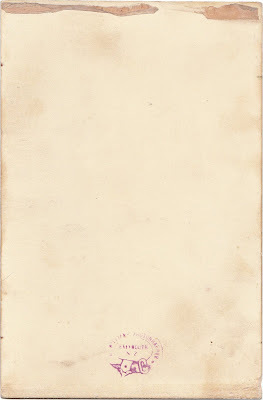 Immediately on arrival he was engaged by a namesake in Collingwood, as assistant, part of his duties being to dispense at the Melbourne Lying-in-Hospital for Drs. Maund and Tracey. In 1861 he was married at Ballarat to Mrs Williams, who has been a devoted a loving wife, a fit helpmate for a sterling man. 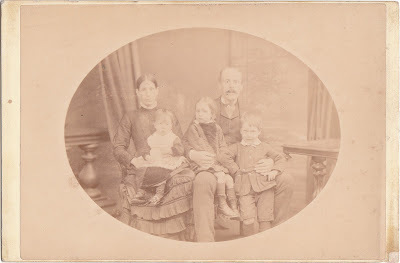 Mr and Mrs Williams arrived in Dunedin early in 1863, and Mr Williams after managing a shop in the Octagon, afterwards started on his own account in George Street. In 1865 attracted by the good news from the West Coast he came to Greymouth and established the business which still bears his name to-day. Mr and Mrs Williams have proved citizens worthy of any town, and have done many kindly acts of devotion and charity. Of their family of five sons, three survive, Charles, Lily, and Heber, and two grandchildren. Mr and Mrs Williams will have the heartiest congratulations of their numerous friends on this occasion, and wishes will earnestly be expressed for many more happy years.